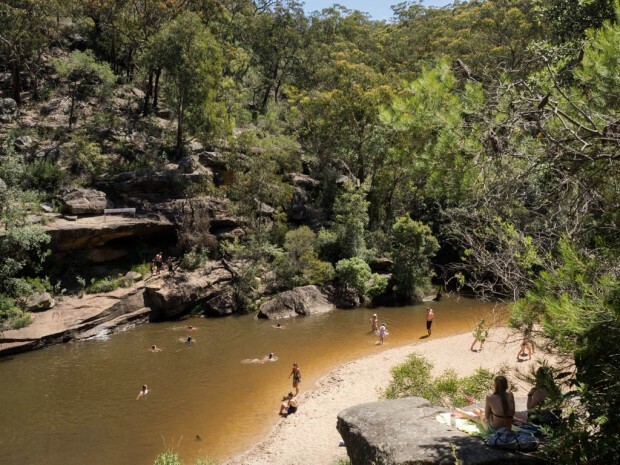 Don’t be put off by the huge crowds that can gather here on a hot afternoon: Jellybean Pool, near Glenbrook in the Blue Mountains National Park, is a real gem of a swimming hole. 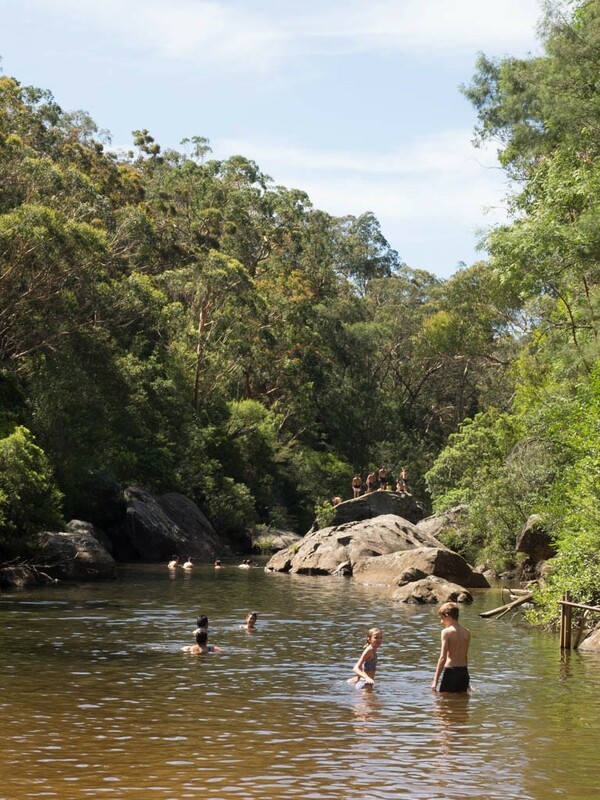 So-called for its shape, Jellybean Pool is a series of deep swimming holes alongside a lazy bend in Glenbrook Creek. 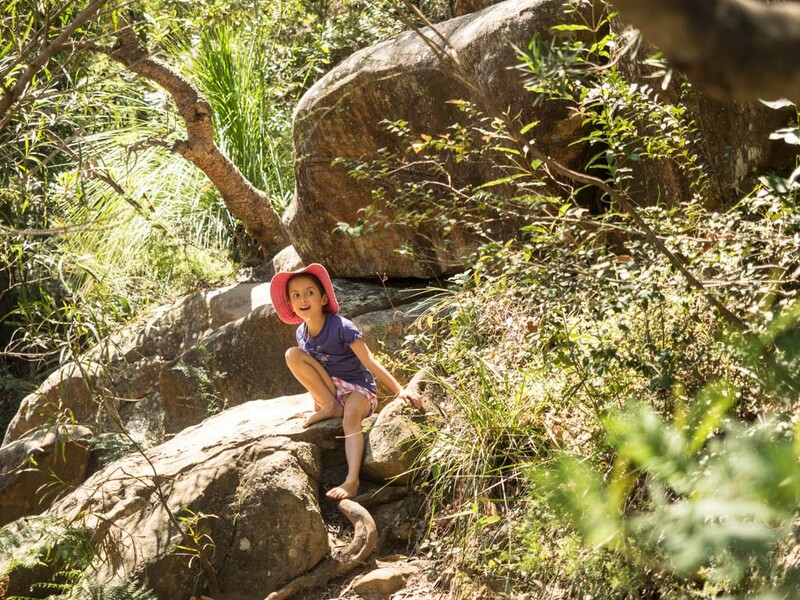 With a gorgeous sandy beach, it’s a real delight for children and pretty easy to get to – only a couple of hundred metres from the main car park and 1km from the park entrance above (easy access for children, albeit with a few steep descents/ascents). My partner, Jane, was initially dismissive (she hates crowds): we were lucky to get a spot in the overflow carpark on a hot afternoon in late December (i.e. right in the middle of school holidays). But once we found a place in the shade of a small tree, she warmed to the undeniably beautiful nature of the place. 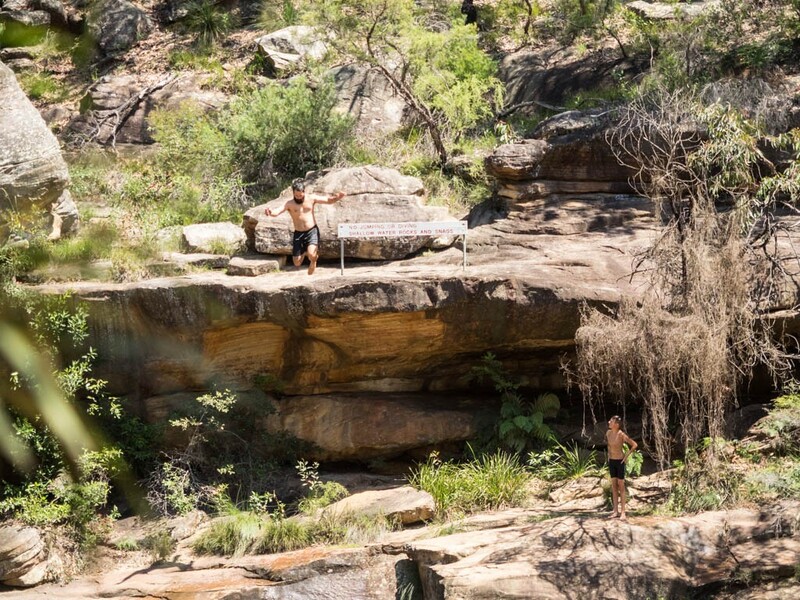 Kids and parents were splashing around in the shallows while testosterone-fuelled boys (and young men) jumped from a rock platform maybe five metres above the water (next to a sign saying ‘No Jumping’). If that sounds a bit too frenetic, a short swim downstream takes you to some large boulders protruding from the creek where you can have relative peace. Our daughter Marilla had a ball, as did her friends when they joined us on our return to Jellybean Pool a couple of months later. To be honest, I never saw the jellybean shape for which it is named but that didn’t matter too much. If you’re camping at Euroka or just need to cool down on a hot day in the Mountains, this is the place to be. Access is from the lower car park (200-300m walk) or from the main park entrance via the Jellybean Track. Be careful with children: there are some sudden drop offs in the pool so always keep an eye on them. Try and work out the deep spots first. There are no bins down at the pool so please make sure you take your rubbish out with you. Hi Natasha – sorry for the slow reply. Just got back from holidays. You can find the address via the link in the Handy Hints section (http://www.nationalparks.nsw.gov.au/things-to-do/walking-tracks/jellybean-track). There’s no BBQ at the pool itself. Hi Zane, I’m afraid not – it’s in a national park and dogs in national parks are a no-go. 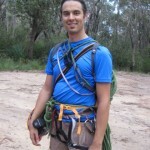 Check out the NSW National Parks policy for more info.